Paul Dye, 52, a Roseville, Minnesota native, (profiled here five years ago) will not have to worry about anyone breaking his record as the longest-serving space shuttle flight director in this country’s history. After the Atlantis completes its mission in a few weeks, there won’t be any more space shuttle flight directors to break it because there won’t be any more space shuttle flights. I called him today to find out what happens when the major component of the U.S. space program ends. Q: What’s your role in this last shuttle mission and then what will you do? Dye: I’m going to be one of the three orbit flight directors so I’ll have the “Orbit Three” team, which is basically when the crew is asleep. When we first started preparing this mission about a year ago, I was following it through the office and I was temporary lead (flight director), but when it became real… we’ve got some guys in the office who need the experience and I’ve had nine or 10 lead flight director jobs over the years so we figured it was time to give someone else the job. I’m kind of mentoring them. So I’m on when the crew is sleeping and we put the plan together for the next day, which if the mission goes as planned, it’s pretty simple, and if we’ve got to change things around, we can be pretty busy overnight. Then when we’re done with this I go back to my other life which is flying the space station. It’s amazing how often people ask, “So when are we going to get some Americans up there, again?” They’re always thinking in terms of the shuttle, but we’ve had Americans in orbit since the space station was first staffed. That’s over 10 years. We fly 24/7/365 and that takes a lot of flight controllers and a fair number of directors to keep that staffed. Q: The last time we talked, you said you would work with a shuttle mission team for about a year before the actual launch, has that schedule changed? Dye: Since I kind of started this mission and then turned it over to another fellow as the lead, I’ve been mentoring him as the lead, I’ve done more than the Orbit 3 would normally do for a flight. But, really, the Orbit 3 person can come in a couple months before flight, take a quick look at it, see what’s different, learn those specific differences, and then do one or two simulations. We generally do one that we call an emergency run; it’s just a day when we go over with the real crew, the real station crew, our station counterparts in the control center, and our team and we run through emergency scenarios. Then we go fly it. This particular one, because it’s the last shuttle flight, I’ve been a little more involved with some of the peripheral activities, some public affairs stuff, and helping people outside of the Agency understand what we’re doing. This one’s taken a little more time than some of the Orbit Threes. When we were in production mode and flying shuttles a lot, at any one time, you were the lead on one mission coming up, you were flying Orbit Two on somebody else’s flight, and Orbit Three on somebody else’s flight. Q: What’s the mood? Out here in the real world, there’s a sense of sadness that the shuttle program is ending. Dye: There is, without a doubt, sadness. There is above all an incredible dedication to continuing to do the job right. The flight isn’t over until all the parts stop moving. And you have to fly right to the end; you can’t let up while you’re coasting down the runway. I’d say, “Yeah, we had a great day.” And they’d say, “No, this is my last day of work.” And right up until they were done, they did not give a hint that they were walking out the door. That’s dedication. Q: Where do they go? What do you do in your business when the job is over? Dye: Well, that’s tough. In the old Southern California aerospace industry model, Company A gets a contract to build a big, new bomber and they hire 10,000 people to do that and it takes them five years. And when they’re done with that production room, everyone gets laid off. But that’s OK because Company B got the contract for the next big contract for the new fighter, and they hired all those people. They walked across the street and they went to work for Company B. That’s the way the aerospace industry worked for decades. To a certain extent that works in the space business; there’s still engineering jobs out there. There are people building commercial spacecraft, working on commercial space. But for my operations people, people who are dedicated flight controllers, flight trainers and the like, there’s nobody else out there doing this right now. So at the very best, they’ve got a couple of years before they can shovel that talent back in to , say, the commercial companies. So what do they do right now? It’s pretty tough. Folks are out there looking. There are lots of folks leaving the aerospace industry to go to other types of engineering. There are a lot of high-tech opportunities for people who are creative. If you have flight in your soul, it’s hard to find something right now. Q: In a presentation you gave in Minneapolis a few years ago, you said that as a species, we are designed to be explorers, even if we’re exploring things in which the payoff isn’t until another generation. Do you still think that? Dye: As a species, I have no doubt that humanity is a race of explorers. There is a difference between humanity and a nation. I think that we will continue to explore as a species. We will continue to explore this planet, there is a great vast ocean bottom that hasn’t been looked at. We will explore low earth orbit some more. We will explore near planets, and we will move out into the stars. This is not to say the United States of America is going to be the one to lead that charge. Just as British Empire tapered off and the Roman Empire tapered off, sooner or later almost all human institutions end, but that does not end what humankind does. I’m a student of history and… a lot of folks have said recently, “why are we still messing around in lower earth orbit? We just keep going exactly where we’ve been for a long time.” It took the early exploration cultures — let’s go with the Portuguese — it took them quite awhile sailing around near coastal areas before they developed the technology to just leave land behind and head out into the deep blue. And to a certain extent that’s what we’ve been doing in lower Earth orbit. We will, I’m quite confident unless we destroy ourselves as a species, move out into the solar system and beyond that. But it takes baby steps learning how to do it. Q: Have you had a chance to sit back and reflect on the changes in technology over the course of your career in the space program? Dye: Every once in awhile I’ll open a file drawer and I will find an old cassette tape from an old offline computer that we would’ve used in the back room of the control center. Or I will find an old 8-inch floppy disk. I still have an 11-inch floppy disk somewhere. The technology that has… I’m sitting here talking on an iPhone, which does almost everything my laptop computer will do for me. All of this capability has happened fairly recently. It all comes from society assuming that technology is always going to advance. We have a generation of people who have never known a time when mankind could not go to space. To them, you just need to launch another satellite, or just use the microelectronics to make this little widget. 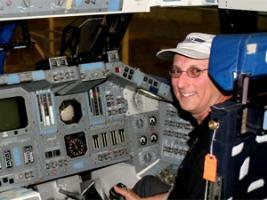 From an aviation perspective, when I started flying the shuttle, all of the instruments were mechanical. About 15-20 years ago, we started replacing all of that with glass cockpit because, frankly, all of the people who knew how to fix all the old mechanical stuff were retired or dying. There was nobody left to redo that stuff. I reflect quite a bit on the way technology has improved. There may be one or two times when I say, “Guys, get rid of the technology. Pick up a pencil and paper and just write me a note.” But most of the time the technology has helped us out. It’s amazing what we have developed in the 31 years that we’ve been flying space shuttles. Q: Do you and your colleagues ever just sit back and say, “this is cool!”? The weirdest thing in the world is for me to realize… I meet with a lot of people who are fascinated by the space program . And they would give anything to be even marginally involved with one spaceflight of any kind. And here I’ve been a flight director on 38 flight missions, I was a flight controller on many more before that. I fly the space station once or twice a month. It’s very easy to sit back and realize… and forget about how privileged we’ve been to be part of this program, and just how incredible it really is. As we learn from our mishaps like the Columbia, things can go bad very, very fast. And a lot of people live in a simulated world. They play a lot of video games, they see things in simulation, they see things on TV and they don’t get out there and realize the real world is moving past you very fast and if something goes wrong, you can get hurt very bad. I think to some extent, we’ve gotten into a culture that a lot of folks don’t experience the real world directly. It’s just been an amazing ride being able to fly the shuttle this long. Q: Of all the people you’ve met at NASA over the years, is there one who stands out as being particularly inspiring to you? Dye: I don’t think I could pick one. I can pick several who’ve been my mentors over the years. Gene Kranz was one. Randy Stone was Gene’s successor and he was a mentor to me. There are so many incredible people that I’ve been able to deal with in our flight control ranks, in the engineering world, in the flight crew ranks; it’s been a privilege to work with all of them. Q: Are you a Minnesotan or a Texan now? Dye: I’m a temporarily misassigned Minnesotan. I’ve never truly adjusted to the climate here. It’s hot. It’s humid. There are good things; the flying weather is good most of the year, I don’t have to drain the oil out of the engine in February at the end of the day after flying, then heat it up on the stove the next morning before pouring it back into the engine to go flying the next morning, which I used to do when I was a kid with a J-3 Cub. But when we’re done here, my wife and I have picked out a place out West, out in the mountains that we’re going to enjoy. Q: When will that be? Dye: A couple more years. I never wanted the shuttle program to end. But if it was going to end, I’m glad it ended before I left so I didn’t have to make the difficult decisions to leave it. My goal is to make sure that everything I was taught by the Apollo veterans who trained me, who came before me, I want to make sure I’ve passed every bit of that wisdom, plus everything else we’ve learned, onto the next generation of people so that I can sit on the sidelines and cheer on the next generation of people who are going to take us into space. Q: What happens when this mission is over? Sheetcake? Dye: We’re going to have a heck of a party. We used to have big splashdown parties after Apollo missions because they landed in the ocean. Then we had “wheels stop” parties in the early days of the shuttle program where we’d all go out in the woods out back. When things got routine, those wouldn’t happen quite as much. But I think we’re planning a good, old-fashioned “wheels stop” party here. I personally want to be in the control center for that last “wheels stop” and I want to sit there for a few minutes with my headset on and then we’ll go out and drink some beer. Q: Are any NASA employees moving to other countries’ space programs? Q: In a perfect world, what would he want to see the shuttle replaced with? Q: What technology will be most crucial to propel space flight to the next level (interplanetary travel)? Bob, thanks for all the aviation and aerospace coverage you’ve done, this one especially. Great interview and a great insight into what is happening as we transition away from the shuttle into something yet undefined. NASA unfortunately is arrogant and won’t adopt any ideas that aren’t internal. For some real technology that will work but it over the horizon visit. come to reality after 25 years of presentation. The in the box thinkers are the biggest impediment to any future technology development. anymore, sorry, but that’s my opinion. An excellent interview, Paul Dye is a incredible person and i had the privilege to talk to him in many occasions since he is a fellow RV flyer also. You would not find a nicer person then Paul. It is sad that such an incredible program has to end based on bureaucracy and stupid politicians.